Conjunctions... not the most riveting of topics we cover in school. Plus, it can be tricky for students to know whether or not a comma needs to be placed with the conjunction in the sentence. However, those opinions probably make the anchor chart even more useful! In my opinion, some sort of graphic organizer or flow chart is a must when introducing this concept to students. Recently, I made this interactive notebook entry that I believe will work well. 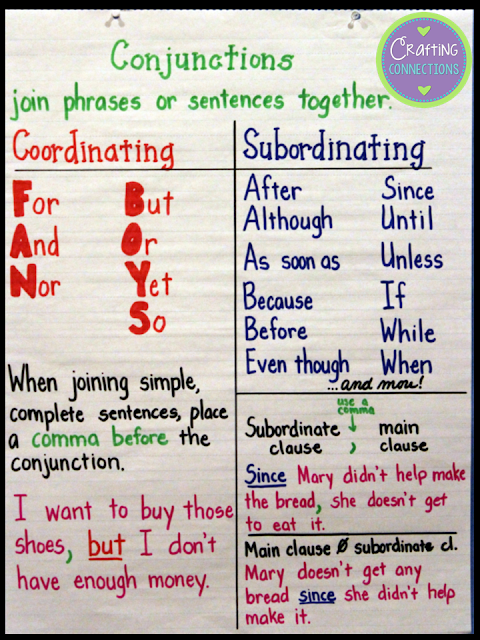 When it is complete, it includes similar information to what is on this anchor chart, but since it is mainly created by the student, it hopefully will aid in retention. Click HERE to download this printable! After students finish their interactive notebook entry, I give them an opportunity to use it while writing sentences with a partner. I place two simple sentences under the document camera, and give them a couple of minutes to combine the two sentences into one complete, correctly punctuated sentence. Sometimes there are multiple ways to combine the sentences, and partners enjoy seeing how many different versions they can write before their time is up. They also enjoy sharing their sentences with the whole group. 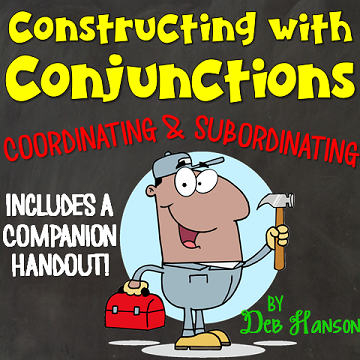 If you are looking for additional conjunction resources, feel free to check out my store. Hey Deb! sorry I've missed a few weeks, but I made sure to link up today!